FILE - In this Nov. 9, 2017, file photo, U.S. President Donald Trump and Chinese President Xi Jinping participate in a welcome ceremony at the Great Hall of the People in Beijing, China. Xi had an “extremely positive” phone conversation with Trump about trade and other issues, the foreign ministry said Friday. The two leaders agreed to “strengthen economic exchanges,” said a ministry spokesman, Lu Kang. 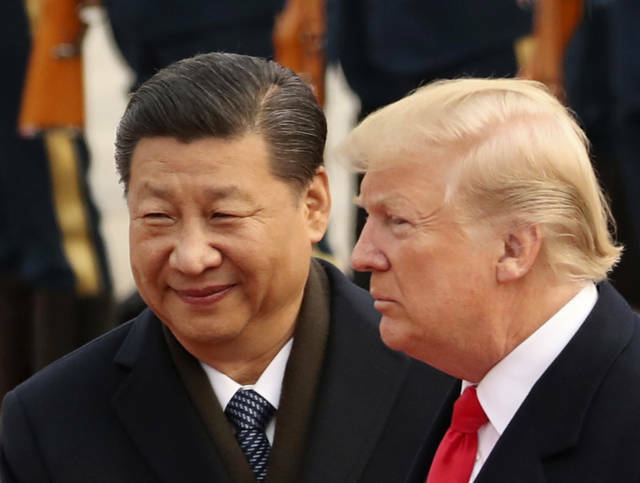 WASHINGTON (AP) — President Donald Trump expressed confidence he can reach a deal to end a burgeoning trade war with China, saying he will meet his Chinese counterpart at the Group of 20 meetings in Argentina in about a month. “I think we’ll make a deal with China, and I think it will be a very fair deal for everybody,” Trump said Friday at the White House before leaving for political rallies in West Virginia and Indiana. Trump said he will have dinner with President Xi Jinping of China at the Nov. 30-Dec. 1 summit of industrial and emerging market nations. The Trump-Xi meeting would be the first since the two countries began hitting each other with import taxes earlier this year. The United States has targeted $250 billion in Chinese products, and Beijing has lashed back by slapping tariffs on $110 million worth of U.S. goods. Trump has threatened to impose tariffs on another $267 billion in Chinese imports — a move that would cover virtually everything China ships to the United States. The world’s two biggest economies are locked in a dispute over U.S. complaints that China is using predatory tactics in a drive to supplant American technological dominance. These include outright cybertheft and forcing U.S. companies to hand over trade secrets as the price of admission to the Chinese market. Earlier Friday, the Chinese foreign ministry said Trump and Xi had an “extremely positive” phone conversation Thursday. The two leaders agreed to “strengthen economic exchanges,” said a ministry spokesman, Lu Kang. He gave no indication whether they made progress on settling the escalating tariff war over Beijing’s technology policy. Trump has railed against the U.S. trade imbalance with China since his presidential campaign, and his administration has grown increasingly vocal about calling out alleged corporate espionage and intellectual property theft by Chinese entities. The two leaders agreed the trade dispute “should be handled properly through substantial consultation,” Lu said.